The afternoon “Roaring Twenties ‘Fidgety Feet’ Classic Jazz Concert / Dance” and the evening “Roaring Twenties ‘Fidgety Feet’ Darktown Strutters’ Ball” are two Savoy Ballroom “Battle Of The Bands” inspired 1920’s style hot jazz and dance band music extravaganzas (run by the same organiser who ran the very highly acclaimed “Roaring Twenties Balmain Battle Of The Bands Ball” in November 2015 and 2016 and “Roaring Twenties Darktown Strutters’ Ball” in November 2017), featuring over 30 of Sydney’s and the Central Coast’s top vintage jazz and dance band musicians. Both of these joyful and exuberant celebrations of classic vintage jazz and the Ballroom / Baltimore / Charleston / Lindy Hop / Blues / Balboa dance styles that went with it, which together brought so much joy and happiness to so many people during the 1920’s Jazz Age after the horrors of the First World War, will be held in the beautifully decorated and historic art-deco-styled Petersham Town Hall (the perfect setting for Roaring Twenties “Great Gatsby” style jazz events! ), which is just five minutes’ walk away from Petersham train station and has plenty of parking nearby, including in the surrounding streets and a convenient carpark just across the road. (1). “Geoff Power’s Original Dixieland Jazz Band”: Geoff Power (trumpet), David Saxon (trombone), Jack Wiard (clarinet), Paul Baker (banjo), Michael Brady (second banjo / guitar), Peter Locke (piano), Jim Elliott (bass saxophone), and Lawrie Thompson (drums). For the evening “Darktown Strutters’ Ball”, this already fabulous line-up will be joined by: James Power (second trumpet), Paul Furniss (second clarinet), and Rod Herbert (sousaphone). Geoff Power is one of the leading exponents of traditional / classic jazz in Sydney, and his great band (with appropriate variations in personnel) will play (amongst others) a selection of great tunes from the pioneering Original Dixieland Jazz Band of 1917-1922, the legendary King Oliver’s Creole Jazz Band of 1923 (featuring the young Louis Armstrong on second trumpet), the San Francisco style Lu Watters’ Yerba Buena Jazz Band of the late 1940’s, and Sydney’s own famous Tom Baker’s San Francisco Jazz Band of the 1970’s (which revived the great jazz music of both King Oliver and Lu Watters). (2). “Geoff Bull’s Olympia Jazz Band” Plus Two (featuring special guests Dan Barnett and Geoff Power / Bob Henderson): Geoff Bull (trumpet), Geoff Power (second trumpet), Dan Barnett (trombone), Paul Furniss (clarinet), Paul Finnerty (banjo), Gary Walford (piano), Stan Valacos (double bass), and Ian Bloxsom (drums). For the evening “Darktown Strutters’ Ball”, this fantastic personnel will vary slightly, with special guest Bob Henderson (second trumpet) replacing Geoff Power, and Lawrie Thompson (drums) replacing Ian Bloxsom. Geoff Bull is one of the “legends” of the Australian traditional jazz scene, having played from the 1960’s onwards with many of the great New Orleans jazz pioneers, and his famous hot Olympia Jazz Band from Sydney will feature the authentic sounds of Roaring Twenties New Orleans and Chicago classic jazz, including more of the tunes from the fabulous King Oliver’s Creole Jazz Band of 1923. Filling the shoes of the immortal Louis Armstrong, who played second trumpet to his idol and mentor King Oliver’s lead trumpet in that legendary band, will be Geoff Power (see above) in the afternoon and Bob Henderson in the evening, both of whom are very highly regarded Sydney traditional jazz band leaders in their own right. (3). “New Empire Ballroom Ragtime Dance Orchestra”: This wonderful band from the Central Coast, which specialises in the big band jazz and dance music of the Roaring Twenties (and dresses in period costumes to match!) 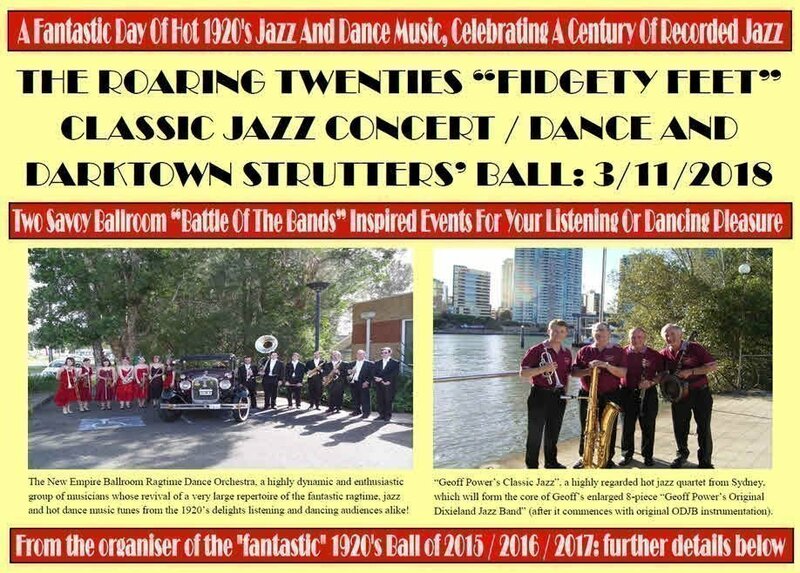 will feature many of the great 1920’s dance orchestra tunes such as “The Charleston”, “Happy Feet”, “Puttin’ On The Ritz”, “Varsity Drag”, “The Baltimore”, “Five Foot Two, Eyes Of Blue”, “Ain’t She Sweet”, etc. You can find out more about this great band on Facebook here. (4). “Pianos At Ten Paces: The Duelling Pianos”: This will be a relatively short set of hot 1920’s style jazz piano solos and duets, inspired by the famous 1920’s “rent party cutting contests”, in which jazz pianists would try to outplay each other, featuring well-known jazz pianists Peter Locke and Tony Gardner battling it out on two pianos! (5). “Clarinet Marmalade” Jam Session: Named after a famous ODJB tune, the various bands’ musicians “jam” together in the “grand finale”, including “Sing, Sing, Sing”! Please note that due to greater time constraints for the afternoon Classic Jazz Concert / Dance, this Jam Session will only occur at the end of the evening Darktown Strutters’ Ball. In addition, during the evening Darktown Strutters’ Ball there will be a great swing dance routine from well-known Sydney swing dance troupe the “Harbour City Hoppers”: please see their great 1920’s style dance routine to “Puttin’ On The Ritz” at the “Roaring Twenties Balmain Battle Of The Bands Ball” (run by the same organiser as this event) in November 2015 held at the Balmain Town Hall at https://www.youtube.com/watch?v=DAAdfDrl9xE. Towards the end of the evening there will also be a short up-tempo “Fidgety Feet ‘Dance If You Dare’ Dance Contest” for those highly talented Charleston / swing dancers who still have the energy left, with great extra prizes for the winners! (1). Recommended Dress Code: For the afternoon Classic Jazz Concert / Dance, the recommended dress code is a minimum of neat casual or evening suit, with 1920’s formal attire optional for those inspired to dress up! For the evening Darktown Strutters’ Ball, this will be a formal dress-up event featuring the clothing styles of the 1920’s to the 1950’s (i.e. the Roaring Twenties, the Thrifty Thirties, the Ferocious Forties and the Fabulous Fifties), with formal 1920’s style clothing particularly encouraged in view of the “Roaring Twenties” Great Gatsby Era style jazz and dance music that will be featured throughout the evening. (2). There will be great prizes at the end of the evening Darktown Strutters’ Ball for “best dressed” in the 1920’s style (man, woman and couple) and “best dancers” (again man, woman and couple). (4). Included in your ticket price (for the evening Darktown Strutters’ Ball only) will be professional hot food catering in the form of one serving of delicious Dutch mini pancakes (“poffertjes”) with various toppings from the Natural Pancake Company. Each portion (with a normal retail value of $8.00) consists of twelve “poffertjes”, which are served with your choice of a range of flavoured syrups and caster sugar. (A) SHARED SEATING / STANDING (ideal for those who will be dancing for much of the time during either or both the afternoon Classic Jazz Concert / Dance and the evening Darktown Strutters’ Ball) on a combination of fixed bench seating along the walls and / or individual chairs without tables along the walls, and possibly a small number of loose chairs in concert-style rows (for the afternoon Classic Jazz Concert / Dance) or tables with chairs (if available) if those have not been sold out already to those people opting for the more expensive (B) GUARANTEED SEAT-ONLY SEATING or (C) GUARANTEED TABLES AND CHAIRS SEATING options (see below). Depending on the number of tickets that are sold in this (A) category, some degree of seat sharing will probably be necessary, so please co-operate in this respect as much as possible whilst you are out on the dance floor “strutting your stuff”. This seating option (A) was already previously listed on the widely distributed printed flyers for the evening Darktown Strutters’ Ball. However, please note that due to space constraints, this option (A) was NOT yet listed on the widely distributed printed flyers for the afternoon Classic Jazz Concert / Dance, which listed only seating options (B) and (C) below, but it has been decided to ADD this option (A) for that Classic Jazz Concert / Dance as well, primarily for the benefit of the afternoon dancers. Please also note that those people wishing to attend BOTH the Classic Jazz Concert / Dance AND the Darktown Strutters’ Ball will be able to purchase “all-day pass” tickets in this category (A) for a discount of $5.00 compared to purchasing tickets to both events individually (see full details below). For the benefit of those wishing to stay in the Hall during the three hours from 4:00 p.m. to 7:00 p.m. that separate the two events, a series of highly dynamic live classic jazz concert recordings (from three famous European jazz bands of the 1950’s and 1960’s) will be played for your listening and / or dancing pleasure. (B) GUARANTEED SEAT-ONLY SEATING (ideal for those who will mainly just be listening to the great jazz music and dancing only occasionally or not at all) in loose chairs in concert-style rows at the back portion of the dance floor. This option is not recommended for dancers unless you are seated at the very ends of each row or along the centre aisle, due to the impossibility of getting from your seat to the dance floor and back again without disturbing the people seated next to you. As stated above, this seating option will only be present during the afternoon Classic Jazz Concert / Dance since these rows of seats will be removed during the evening Darktown Strutters’ Ball to bring the dance floor back to its normal full size. (C) GUARANTEED TABLES AND CHAIRS SEATING (ideal for both listeners and dancers, and also for those who will be bringing their own meals and drinks) at tables and chairs flanking the dance floor, which will be set aside specifically for ticket-holders in this category. These slightly more expensive tickets will be sold for both the afternoon Classic Jazz Concert / Dance and the evening Darktown Strutters’ Ball. Although a seat at a table will be guaranteed for everyone in this category, there will be no prior specific seat reservations, i.e. these guaranteed seats at tables will be claimed on a “first come, first served” basis, so please arrive early if you want a seat and table with the best view of the stage and / or dance floor. As with seating option (A) above, please also note that those people wishing to attend BOTH the Classic Jazz Concert / Dance AND the Darktown Strutters’ Ball will be able to purchase “all-day pass” tickets in this category (C) for a discount of $5.00 compared to purchasing tickets to both events individually (see full details below). As also briefly described for option (A) above, some great jazz concert recordings will be played during the three hour interval between these two events. (i). “Earlybird” online tickets (until 28/10/2018): $25. (ii). Full Price online tickets (from 29/10/2018 until 2/11/2018): $30. (iii). Paper tickets (bought for cash) in advance direct from the organiser at selected live Sydney and Central Coast jazz venues only (Sydney Jazz Club monthly concert, Club Ashfield on Friday nights, “Jazz In The Kirk” in Manly, and Central Coast Leagues Club in Gosford on the last two Sundays in October): $25. (iv). Paper tickets (bought for cash) at the door (only if not sold out): $35. (i). “Earlybird” online tickets (until 28/10/2018): $30. (ii). Full Price online tickets (from 29/10/2018 until 2/11/2018): $35. (iii). Paper tickets (bought for cash) in advance direct from the organiser at selected live Sydney and Central Coast jazz venues only (Sydney Jazz Club monthly concert, Club Ashfield on Friday nights, “Jazz In The Kirk” in Manly, and Central Coast Leagues Club in Gosford on the last two Sundays in October): $30. (iv). Paper tickets (bought for cash) at the door (only if not sold out): $40. (i). “Earlybird” online tickets (until 28/10/2018): $35. (ii). Full Price online tickets (from 29/10/2018 until 2/11/2018): $40. (iii). Paper tickets (bought for cash) in advance direct from the organiser at selected live Sydney and Central Coast jazz venues only (Sydney Jazz Club monthly concert, Club Ashfield on Friday nights, “Jazz In The Kirk” in Manly, and Central Coast Leagues Club in Gosford on the last two Sundays in October): $35. (iv). Paper tickets (bought for cash) at the door (only if not sold out): $45. (i). “Earlybird” online tickets (until 28/10/2018): $40. (ii). Full Price online tickets (from 29/10/2018 until 2/11/2018): $45. (iii). Paper tickets (bought for cash) in advance direct from the organiser at selected live Sydney and Central Coast jazz venues only (Sydney Jazz Club monthly concert, Club Ashfield on Friday nights, “Jazz In The Kirk” in Manly, and Central Coast Leagues Club in Gosford on the last two Sundays in October): $40. (i). “Earlybird” online tickets (until 28/10/2018): $45. (ii). Full Price online tickets (from 29/10/2018 until 2/11/2018): $50. (iii). Paper tickets (bought for cash) in advance direct from the organiser at selected live Sydney and Central Coast jazz venues only (Sydney Jazz Club monthly concert, Club Ashfield on Friday nights, “Jazz In The Kirk” in Manly, and Central Coast Leagues Club in Gosford on the last two Sundays in October): $45. (iv). Paper tickets (bought for cash) at the door (only if not sold out): $50. (i). “Earlybird” online tickets (until 28/10/2018): $60. (ii). Full Price online tickets (from 29/10/2018 until 2/11/2018): $70. (iii). Paper tickets (bought for cash) in advance direct from the organiser at selected live Sydney and Central Coast jazz venues only (Sydney Jazz Club monthly concert, Club Ashfield on Friday nights, “Jazz In The Kirk” in Manly, and Central Coast Leagues Club in Gosford on the last two Sundays in October): $60. (iv). Paper tickets (bought for cash) at the door (only if not sold out): $75. (i). “Earlybird” online tickets (until 28/10/2018): $75. (ii). Full Price online tickets (from 29/10/2018 until 2/11/2018): $85. (iii). Paper tickets (bought for cash) in advance direct from the organiser at selected live Sydney and Central Coast jazz venues only (Sydney Jazz Club monthly concert, Club Ashfield on Friday nights, “Jazz In The Kirk” in Manly, and Central Coast Leagues Club in Gosford on the last two Sundays in October): $75. (iv). Paper tickets (bought for cash) at the door (only if not sold out): $90. Please be advised that all tickets purchased online will be subject to an additional 3.85% booking fee. For any online ticketing difficulties, please telephone Ticketebo on Ph. : 03 9005 7750. For further enquiries, please contact the event organiser Robert Scheltema de Heere by email at robertsdh@hotmail.com.